Buying house warming presents is the perfect excuse to browse gift and homeware websites without feeling guilty that I'm making a mental wishlist for my own house. While looking for the perfect house warming present for one of my best friends I stumbled upon Mollie and Fred. The website a huge selection of brands and gift ideas to suit lots of different styles and recipients. 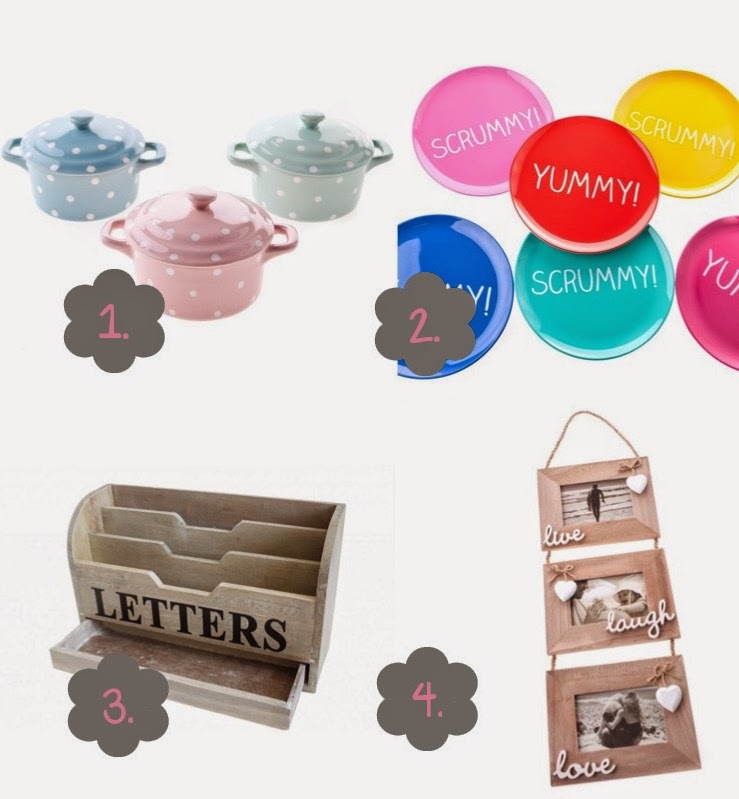 I think it's quite obvious from my Mollie and Fred wishlist that I've been loving their kitchen and wooden selection. The Gisela Graham spotted casserole dishes are perfect for sticking to healthy portion sizes especially when it's something you wouldn't think twice about over serving, like macaroni cheese! I can see my boyfriend having a blue one and me having a pink one, haha. The Happy Jackson multi coloured plates are so bright and cheery, I love the yummy and scummy design. One of the things that annoys me in my house at the moment is when our post builds up and looks messy on the table in the hallway. This wooden Letter Tidy would be a lovely little organiser. Live, laugh, love is a happy go lucky quote that's perfect for some photos of family and friends. The wood, rope and hearts is typical Sass and Belle and would look great in the hallway or bedroom. Have you discovered Mollie and Fred? What's your favourite house warming present you've ever received or given?